On September 11 2007, there was more action for 9/11 truth in more locations around the world than ever before. We are creating an unstoppable momentum for justice. Join us in action on October 11. 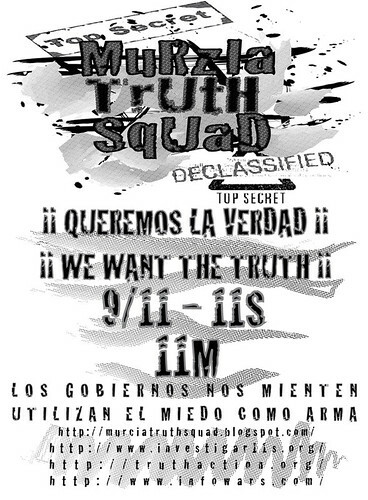 On July 11 2007 the Murzia Truth Squad in Murcia Spain joined the international campaign for Action on the Eleventh Day of Every Month until Justice. We encourage good people around the world to join us and we implore American citizens who have not yet gotten involved to TAKE ACTION ON AUGUST 11! Once again we will be reporting on the Actions of the Eleventh from around the world on Truth Revolution Radio. Call in and leave an action report on the hotline at 1-512-646-6455 anytime today or call in live to the show between 9 and 10 pm pacific at 1-888-202-19844. Murzia Truth Squad in Murcia, Spain will be joining us in Action on July 11th.